INDIAN princes were well-known for their exotic jewels and treasures. But, even among such potentates, the pearl carpet, once owned by the Maharaja of Baroda, was a rare item, and it ranks with the Mughal Peacock Throne as a symbol of fascinating India. Its history is interesting. In the early 1860’s, Maharaja Khande Rao of Baroda, who owned fabulous diamonds like the Star of the South, became possessed with a strange desire, that he must offer a priceless pearl carpet at the shrine of Prophet Mohammad in Medina. We do not know as to what made him take this vow. 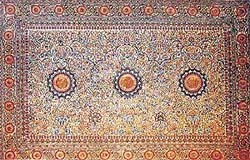 It appears that he wanted a pearl carpet, or chaddar, as it is reverentially called, to be gifted by him and spread over the Prophet’s tomb in the mosque at Medina in Arabia, just like the pearl carpet which was spread over the tomb of Mughal Empress Mumtaz Mahal in the famous mausoleum of Taj Mahal at Agra. But, this idea of a grand gift to an Islamic shrine by a Hindu sovereign was not liked by his palace officials and other courtiers. After all, Baroda was a Hindu state. But the Maharaja was adamant and by 1865 the carpet was ready. But after Maharaja Khande Rao died, the pearl carpet was not sent to Medina, and was retained as a state treasure in Baroda. It was a carpet made of diamonds, pearls, rubies and emeralds and measured, roughly, seven and half feet by six feet. In 1879, Sir George Birdwood, the eminent connoisseur of Indian jewellery, called it "The most wonderful piece of embroidery ever known." Composed entirely of wrought pearls and precious stones disposed in Arabesque patterns, it was valued at Rs 6 million when made in 1865. Although the richest precious stones were worked into it, the effect was harmonious. When spread out in the sun, it seems suffused with an iridescent glow, as gratifying to the eyes as were the exquisite forms of its Arabesques. Its base was made of deerskin and silk stitched together. The design is mostly made of pearls with a restrained effect and with dignified, classic Arabesque-Mughal-derived designs". The last time the public saw it was during the Delhi Durbar of 1903, when the then Maharaja of Baroda, Sir Sayaji Rao Gaekwad, allowed it to be displayed, as a mark of respect for the British sovereign. It was photographed and detailed descriptions of it are available. It was then displayed in the precious objects gallery and the catalogue quoted its description thus: "The circular portion displayed was probably intended as the veil or canopy and with the rectangular carpet shown on the wall of the Loan Collection Gallery close by, is one of the four pieces that are said to have formed the carpet. According to the official report, that accompanied these most curious and interesting exhibits, it is affirmed that the entire carpet cost Rs 6 million. The field is seed pearls, the Arabesque design in blue and red being worked out in English glass beads with medallions and rosettes of diamonds, rubies, emeralds freely dispersed all over it. Four large weights in solid gold, thickly set in diamonds, were constructed to be placed on the four corners of the carpet." This pearl carpet was in India till the early 1940’s. One does not know, as to when it was taken out of the country. But till 1947, the maharajas were free to take their treasures in and out of India during their frequent trips to Europe and America. In 1943, the then Maharaja of Baroda, Sir Pratap Sinh Gaikwad, married a beautiful woman known as Sita Devi, who became his second maharani. Sita Devi took up her residence in Europe and soon, most of the Baroda treasures were transferred to her mansions in Monte Carlo in southern Europe. But in 1947, the state of Baroda was merged with India. Outraged by the anti-India activities of the Maharaja, the Government of India deposed him and forced him to return to India some of the most precious items, like the seven-strand diamond necklace and the fabulous seven-strand pearl necklace. But the pearl carpet continued to be in the possession of Sita Devi. Her marriage with the Maharaja ended in a divorce in 1956 and the Gaikwad himself died in London in 1968. Sita Devi survived him by 18 years. By then the fabulous Baroda treasures had been dissipated. But, it appeared, that the pearl carpet was intact, and it was thought to have been kept in a bank vault in Geneva. Eminent Indologist Stuart Welch, in his book, Indian Art A.D. 1300 to 1900, ascribes the picture of the pearl carpet in the book to "Sita Devi collections". The treasure’s history was updated in January, 1994, when a news item appeared in Indian and Arabian newspapers, describing the Baroda pearl carpet as a 400-year-old prayer rug. A report quoted a Saudi-based agent, Hisham-al-Baroodi, as saying that he was currently negotiating with relevant Saudi officials to take the rug to the kingdom, where he was confident of funding a buyer. The account described the rug as being decorated with three shining diamonds in the middle, laced with pure gold and surrounded by blue, red and turquoise-blue pearls.